Emerging interfaces for video collections of places attempt to link similar content with seamless transitions. However, the automatic computer vision techniques that enable these transitions have many failure cases which lead to artifacts in the final rendered transition. Under these conditions, which transitions are preferred by participants and which artifacts are most objectionable? We perform an experiment with participants comparing seven transition types, from movie cuts and dissolves to image-based warps and virtual camera transitions, across five scenes in a city. 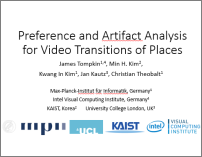 This document describes how we condition this experiment on slight and considerable view change cases, and how we analyze the feedback from participants to find their preference for transition types and artifacts. We discover that transition preference varies with view change, that automatic rendered transitions are significantly preferred even with some artifacts, and that dissolve transitions are comparable to less-sophisticated rendered transitions. This leads to insights into what visual features are important to maintain in a rendered transition, and to an artifact ordering within our transitions. © ACM, 2013. This is the author's version of the work. It is posted here by permission of ACM for your personal use. Not for redistribution. 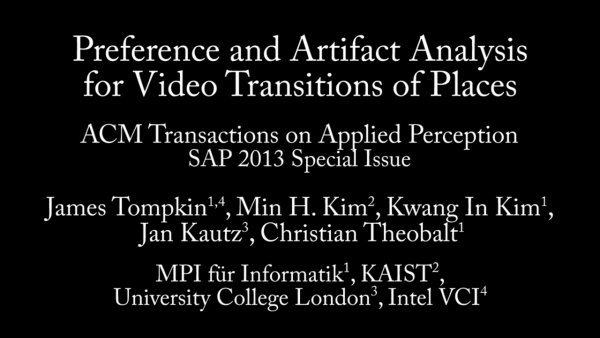 The definitive version was published in ACM Transactions on Applied Perception, Vol. 10, Issue 3, August 2013, http://doi.acm.org/10.1145/2501601.